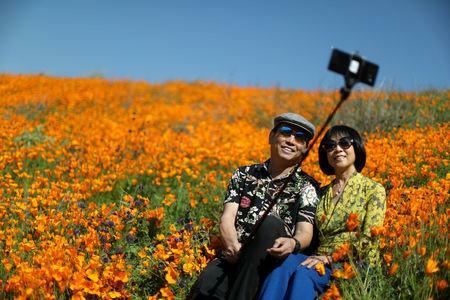 (Reuters) - Spring has arrived in Southern California and with it a crisis has blossomed in the small city of Lake Elsinore, where tens of thousands of visitors have flocked to see a "superbloom" of poppies in a desert canyon. "This year's is substantially larger than we've ever seen in terms of the numbers of flowers and the numbers of visitors," Lake Elsinore City Hall spokeswoman Nicole Dailey said. 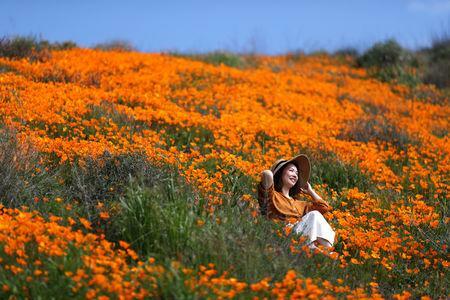 The previous superbloom occurred in 2017. 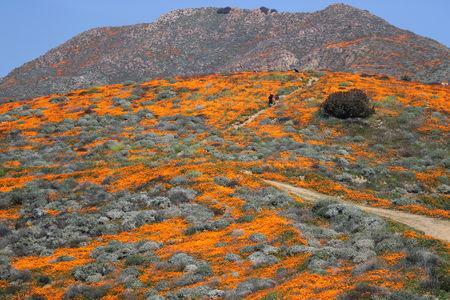 Some local residents have expressed outrage at the crowds and resulting gridlock, dubbing the superbloom season the "Poppy Apocalypse." The hashtags #PoppyNightmare and #IsitOverYet have also popped up on social media. "We know it has been miserable and has caused unnecessary hardships for our entire community," a posting on the city's Facebook page on Sunday said. Lake Elsinore has enlisted the help of the California Highway Patrol, the county sheriff's office, neighboring cities and private contractors to manage traffic around Walker Canyon, which has no designated public parking. "We did not expect the crowds that we saw," she said. "Our freeways and our cities are not designed for crowds that you see in L.A."